Annie Samanatha Ward was born on July 6th, 1991. It was a very hot day and just as the Wimbledon Ladies Final was about to start, my waters broke. It should have been exciting, but it wasnt, it was terrifying. I had already been in hospital with problems for four weeks, and I was only 32 weeks pregnant. Annie was delivered by Caesarean, with her mother soundly asleep, thank goodness. When I awoke, I was being given blood and antibiotics, and my baby daughter was in Special Care. We lived in Germany then, her father was in the Royal Air Force, and the hospital was 50 miles from our home. This was hard on us all, especially my son Charlie, who was only 21 months at the time. But he was so happy when he saw his new little sister, glad that at last, he had someone to play with. Annie was just 2 weeks old when we were told she was well enough to bring home. Before long she was strong and healthy - a real survivor. Im glad I didnt know how little time she had with us, and Im glad she was born early - I see those 8 weeks as a bonus, 2 extra months to spend with my little girl. 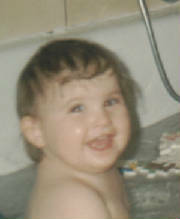 Whenever Annie was in the bath, you had to stand well back or you would be soaked! She loved to splash and screamed with laughter as she did so. Anyone near the bathroom would have to change their clothes afterwards. Annie was a real water baby! April 16th 1993 - a beautiful warm spring day, quite unseasonal in fact. Annie had been restless the previous night, so understandably, she was rather quiet. We walked to the shops, Charlie, Annie and I. It was the Easter holidays - Charlie had not yet gone back to Kindergarten. She was so quiet, not kicking her legs in the pushchair as usual. Annie was flown back to Wales, where her father and I both came from. The funeral passed in a haze I barely remember and she was buried beneath a mass of flowers from those that loved her so much. Life seemed to stand still. The rest of us returned to Germany, incomplete, as we will always be without her. Slowly, everyone stopped calling and went back to normal. I dont think anyone who hasnt lost a child could ever hope to understand that there will never be a 'normal' for me, with Annie gone. Eventually we moved back to the UK, to Wales, for which I was thankful. Visits to her final resting place are frequent, still. A year later, I had another baby - a baby brother for Charlie. Billy James arrived in 1994, and three years later, after the heartache of a miscarriage, Sam Robert came along. I could have no more, Annie was to be my only daughter.